I had the wrong angle to show Kevin Phillips' 10 yard TD run on the 1st play of overtime but did capture Jarred Billups being held behind Kevin. 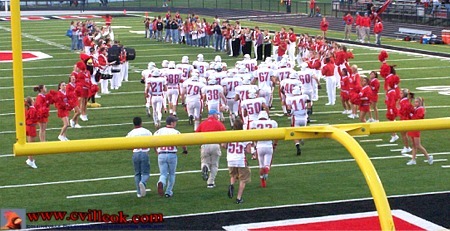 Collinsville won 7-0. 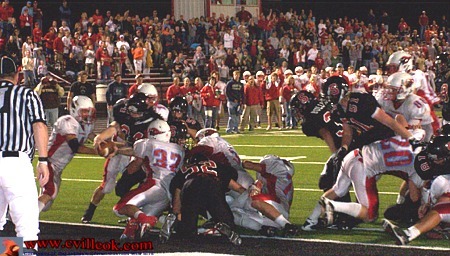 After 2 Collinsville timeouts to give the Skiatook kicker time to ponder the field goal attempt on the final play in regulation, the kick was wide and the teams went into overtime. 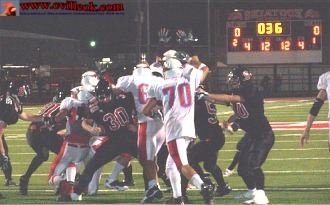 Skiatook had lined up for field goal attempts twice in the first half with bad snaps not allowing a kick. 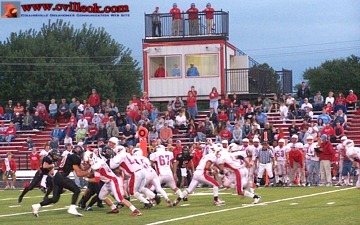 Collinsville had a field goal attempt blocked in the 3rd quarter. 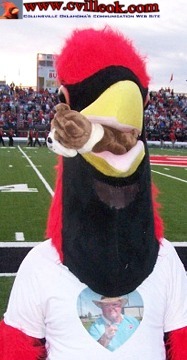 Carson the Cardinal put the bite on a Bulldog while wearing a Coach Craig shirt. 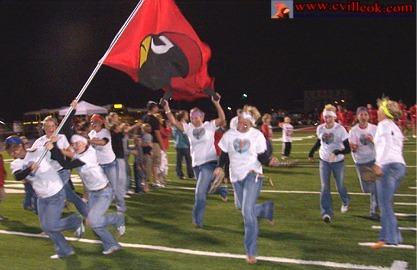 The Softball Lady Cards led the Football cards onto the field after halftime. They had defeated Oologah and Hale at the Oologah tournament and play again at ~10am Saturday. The Cardinals opening drive started with 3 consecutive offside penalties against Skiatook so they were at mid field before a play counted. 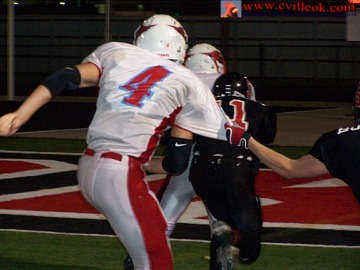 Collinsville reached Skiatook's 42 before being pushed back and punting on 4th and 20. 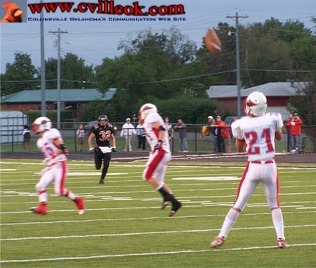 Alex Goosen (#21) took the opening kickoff out to the 34 yard line to set up Collinsville's 1st offensive series.